Before a company has an opportunity to explain its identity, its visual image has already done a lot of talking. A corporate typeface – along with logos and colours – is often the first contact an organization has with its audience in commercial and advertising environments. And because first impressions can be lasting, it’s crucial the right message be sent. Once a company has defined its identity, typeface can be utilized to help relay that information to the public. While it may seem odd that the style, size and colour of lettering holds that much power, there’s no denying the emotional reactions one can have to a visual. There’s a lot to be said for the way a sleek and serifed font can emanate elegance while a bold and capitalized one can scream adventure and daring. Type has personality just as companies do, which is why a thoughtful pairing of the two can have a significant impact. Decide what feelings you want your company to invoke. Harness them in a corresponding typeface, and let your visual identity speak for itself. With an endless supply of typefaces available, companies have the luxury of being picky and choosy for their brand. Browse through various options until you’ve found the perfect fit for your visual identity. Sometimes, however, companies don’t need an entire new corporate typeface. It may be that the current typeface needs adjusting because its weight isn’t quite right or the serif on some letters isn’t working with other visual elements. Design companies offer a myriad of services, including modifying existing font, creating custom font weights and adding related fonts to supplement those your company may already be using. 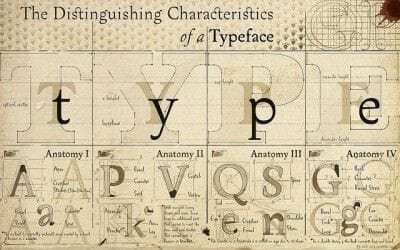 While a large selection of fonts is valuable, one the other hand, it can make choosing the perfect typeface confusing. If the selection has you overwhelmed, consider a custom corporate typeface for your organization. Some design companies offer this option, and work with a company to develop a typeface tailored to their needs. Custom corporate typefaces may be suitable for large or fast-growing companies, and can come with many benefits, including exclusivity, licensing options and longevity. Typeface helps tie a brand together, and can enhance other elements of a company’s visual presentation. You may have a memorable name, sharp slogan or eye-catching logo, but the wrong typeface can render those components meaningless. The appropriate typeface can act as a bolster for other branding pieces, raising them to a level they’d be unable to reach on their own. Not only can the style of typeface elevate your company’s brand, but colour and size also play important roles. Consider how piecing these aspects together can create a harmonious – and visually stunning – final product. For some companies, typeface is their logo. Google uses the famous colour distribution of blue, red, yellow and green across letters. Facebook’s white, lowercase ‘f’ set on a blue background is instantly recognizable. Without pictures, designs or patterns, companies are able to create a visual identity that is powerful and memorable. When designing your company logo, consider how a corporate typeface can enhance its appeal as a supporting – or lead – component. If a visual presentation is cluttered, difficult to read or confusing, the audience is likely to move on. Even if a product has exceptional content, the value is diminished as soon as it is presented in an unfavourable way. Rather than turning away the public, draw it in with a typeface that is clear, clean and easy to read. The less effort a person has to make when contacting your visual identity, the more likely they are able to linger – and remember. A thoughtfully considered visual identity has the ability to exude professionalism. Incorporating the appropriate typeface in a brand helps make it look official and established. A company that cares enough to allocate time, money and resources into its professional image can also create credibility with its audience, especially when compared to the company that has a sloppy and poorly executed image. Once a company has created a first impression with its visual presence, typeface can help make it lasting. Having a recognizable typeface associated with your company means less response effort for the audience. All it can take is a quick glance at the typeface to instantly trigger memories, feelings and thoughts about your company. Pairing a specific typeface with your company’s image will also help make it recognizable across contexts. Whether someone sees it while flipping through a newspaper or spies it on a sign across the street, typeface can help make that quick connection between your company and an individual. Having a unique typeface can also make your company’s product discernable from others on the market similar in nature. Make sure your audience recognizes your company in different environments – from storefront to the company car – as well as various medium, whether it’s on TV, in print or on signage. Choosing a trademark typeface will help the public detect your company, and in turn, give it an air of familiarity. Companies have the ability to leave a mark with their visual identity. To ensure it is a positive one, consider the important role a corporate typeface plays in branding. Don’t let all your company has to offer go unnoticed simply because of a communication lapse. Ensure the public knows who you are and what you stand for by offering a visual marker they can use to find and relate to you. Jon Gilchrist is the Sales and Marketing Manager for Cheques Now Inc. His professional life is dedicated to providing business owners, payroll managers and accountants with secure, low-cost cheques. Follow him on Google+.